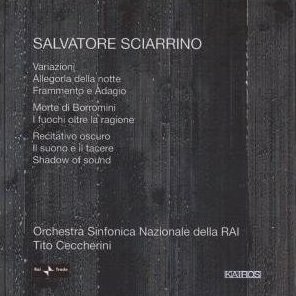 Sciarrino's sound world has become a familiar, distinctive one, gaining for its composer a reputation that precedes him. Its style is located within a play of shadow and light in sound tone, an inventive perspicuity of timbre. When the listener thinks of Sciarrino's rigorous and minute method, which manipulates extended instrumental technique to garner gradated wisps of sound, the music would suggest more ready amenability to the intimacy of a chamber setting than to the yawning space of a concert hall – not to mention casting doubts as to how conducive its vicissitudes would be to the massed force of a modern orchestra, which obviously has connotations more towards musical gigantism and weightiness of instrumental gesture. Which just goes to show you shouldn't trust your instincts – this three-disc collection redressing any such assumptions in offering a comprehensive overview of the Italian's orchestral works from the mid-seventies to the present day. The traditional concerto format has a presence throughout the chronology, featuring a more or less active engagement by the composer with its strictures. Offering up a single instrument's palette against the brother one of an orchestra is still a useful format and resource. Variazioni from 1974 opens the collection in a thrilling and warped ululation along a brooding landscape of cello harmonics and strange acoustic ejaculations from the orchestra. A fluttering like bird's wings leads off from a springboard of percussive rumblings on bass drum, breathed winds, and occasional rasped multiphonics on clarinet shining like metallic sheets. There is a fast-slow-fast dynamic to the work, though the effect is more of a dip in tone colour than a deceleration in tempo. For the listener this makes for an exciting adventure across an unwelcoming and unpredicted landscape, breaking away as it does from musical clichés and tropes of the past. And it must be said that the sounds here do make much other contemporary writing appear uninventive and dull in its comparative, compulsive light. Although arising in reaction to the pervading serial dogma of the post-fifties avant-garde scene, Sciarrino's luxury of timbral interplay is obliquely indebted to that focus on klangfarbenmelodie that arose from serialism and its privation of pitch-based interest. The Italian composer considers his Allegoria della notte as throwing an obverse perspective on Mendelssohn's violin concerto, utilising as its starting point what that work leaves behind, and with the older work occasionally poking its head round the corner in bursts. As an engagement with the withered face of the tradition it is sophisticated and beguiling. The same goes for Frammento e Adagio, two fragments of a projected flute concerto, the first of which generates an acoustic tableau somewhat akin to a cat stuck inside the stereo, flailing moodily in repetitive rhythmic impress to a continuous shimmer and hum like a power generator heard in the distance. The second fragment sounds as if its action is set underwater, rich and strange indeed. It's up to the listener what they decide to make of most of the works: programme is usually neither prescribed nor proscribed by the composer, and the vivid skein of imagination invariably enveloping each piece, filled as each is with unidentified sonority, seems both to demand it and feed off it. An exception to this is Morte di Borromini, wherein Sciarrino sets an autobiographical text by baroque architect Francesco Borromini for speaker. The text is dramatized instrumentally, recreating the mood of the night upon which its action occurs – the writer's suicide. Sciarrino's concern is with creating a world, one to which the listener has temporary admittance. The eighty-two players decked out to fashion it are used so sparingly as to create almost an oblique source of tension by their mostly silent presence over the course of the work. In an age when the orchestra is supposedly exhausted as a compositional paradigm, Sciarrino does the orchestra justice, showing that there's plenty of life in the senile slobbering old dog yet for any who approach it with the right touch. The steady slowness of the works here, along with the microscopic attention to timbral detail, sometimes recalls Grisey (one of the movements of Vortex Temporum is dedicated to Sciarrino). There are other crossovers as well between the Italian's 'physiological cosmos' and the Frenchman's 'acoustic spaces' of which this isn't the place to elaborate. Perhaps, though, the listener imagines they have begun by listening to a Sciarrino work and at the end find themselves in the midst of one by Grisey: how did that happen? Answer – it can't have. But anyway, back to the more practical roundheaded work of reviewing. The final three works are the most recent ones on the collection. They include a piece for piano and orchestra, Recitativo oscuro, the most discursive work here. Sciarrino's own view is that in his later works there is a progressive move towards the voice, and that is readily apparent here, in both name and sound. At times the music comes across like a mutant brother of Ionisations, with pitched instruments sounding like percussion, flute trills wafting in and out shrilly, all to a perpetual ominous bass drum heartbeat. The limited use of the piano's keyboard generates echoes in vicious orchestral outburst. And there are perhaps deliberate echoes here also of the first work on the collection, Variazioni, which also features muted bass drum strikes intoned in the background and flutters in other percussion. A percussive heartbeat again frames Il suono e il tacere, continuous behind anthropomorphic orchestral groans and sighs. Little phrases are shared around the orchestra, reiterated at the same pitch or in octaval transposition, unambiguously modelled on a declamatory human voice. If there is the feeling that the later works are becoming slightly more traditional in manner it is not through a reduction of the idiosyncrasies that define Sciarrino's craft; rather it is through a maturation and expanded scope in that craft. This is a worthy release, with the recording quality (conveying brilliantly the depth of sound that is so important to the music) and performances (by the Orchestra Sinfonica Nazionale della RAI) both outstanding. If you have the money to spare, which you probably do, and are into that sort of thing, which you might be, you could do worse than to check it out.